Harold Burson’s role in the infamous New Coke launch began when his phone rang a few days after Christmas, 1984. “He called me at home, which was very unusual,” the co-founder of what is today the world’s largest public relations firm, Burson-Marsteller, recalled last fall during an employee event at Coca-Cola headquarters in Atlanta. The voice on the other end of the line was his client and close confidante, Coca-Cola Chairman and CEO Roberto Goizueta. Goizueta, Coke’s first non-American CEO and the first with a technical/engineering background, had made his mark early in his tenure at the helm through a series of gutsy moves. In 1982, he spearheaded the wildly successful launch of Diet Coke, the first-ever extension of the closely guarded Coca-Cola Trademark. He also made the decision to step outside the company’s core business with the acquisitions of Columbia Pictures and Sterling Vineyards. Both deals – while ultimately profitable – were initially seen as risky by many. What was on Goizueta's mind in late 1984 was far bigger and bolder. When Burson arrived at Coke HQ in Atlanta, Goizueta walked him through a series of charts. After the windup, Goizueta delivered the pitch. “He said, ‘We’re going to change the formula of Coca-Cola,’” Burson recalled. Harold Burson works the phones in his New York office in the early-1980s. With its primary competitor quickly gaining ground, Coke was faced with two options: Change its marketing or change its flagship product. A small task force was assigned to prep for an April rollout. Burson was the lone non-employee who knew about the stealth plan, which included packaging, branding, advertising, PR and more. In those first few weeks, Goizueta leaned on Burson for advice and counsel, pressing him to spot holes in the blueprint. A blind sip test of more 100,000 consumers nationwide favored New Coke over the then 99-year-old original. But what the studies didn’t show was the emotional bond consumers felt with their Coke – a beloved drink and brand they didn’t want anyone tampering with. “They did not know how proprietary the public felt about Coca-Cola,” said Burson. Goizueta approved a second round of taste tests, which delivered similar results and, thereby, reinforced the decision to launch what would be known as New Coke. The Burson-Marsteller team’s PR strategy included sending 12-packs of Coke to every major newsroom in the country and all 535 members of Congress. A high-profile press conference was planned for Tuesday April 23, 1985 in New York, but Beverage Digest leaked the news the Friday before. By the weekend, the story has reached the mainstream media. Burson Marsteller Co-Founder Harold Burson at Coca-Cola headquarters, September 2014. Neither did the fact that Coke struggled to clearly describe the taste of its new offering. Negative sentiment snowballed in the weeks that followed. The New Coke launch unleashed an avalanche of calls, letters and protests. Loyalist clubs formed almost overnight, and fans from coast to coast hoarded and even scalped cases of original Coke. Eventually, Coke listened to its fans and made the decision to bring back the original formula after only 79 days – on July 11, 1985. 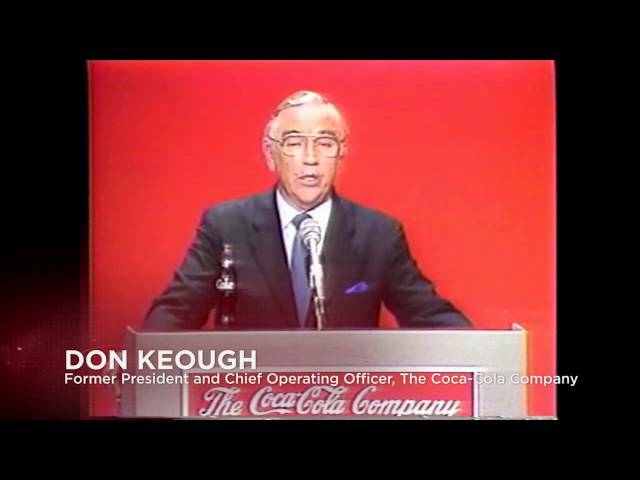 Coca-Cola President Don Keough was tapped to deliver the news to the public via a prime-time TV commercial. Sales of Coca-Cola classic surged, restoring the brand as the frontrunner in the cola wars and affirming a truth countless marketers continue to learn and relearn – that consumers, not companies, own the world’s most cherished brands.